Wright combines politics, scripture, and the participants’ personal histories into a compelling narrative of the fragile peace process. Begin was an Orthodox Jew whose parents had perished in the Holocaust; Sadat was a pious Muslim inspired since boyhood by stories of martyrdom; Carter, who knew the Bible by heart, was driven by his faith to pursue a treaty, even as his advisers warned him of the political cost. Wright reveals an extraordinary moment of lifelong enemies working together—and the profound difficulties inherent in the process. 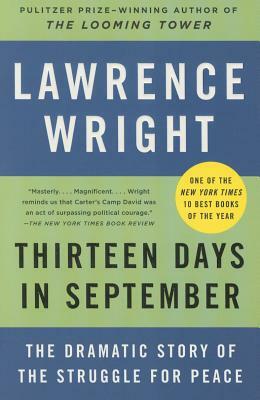 Thirteen Days in September is a timely revisiting of this diplomatic triumph and an inside look at how peace is made. Lawrence Wright is a staff writer for The New Yorker and the author of six previous books of nonfiction, including In the New World, Remembering Satan, The Looming Tower, Going Clear, and one novel, God’s Favorite. His books have received many prizes and honors, including a Pulitzer Prize for The Looming Tower. He is also a playwright and screenwriter. He and his wife are longtime residents of Austin, Texas.